And yet, every year, I never do any of it. I involuntarily become a real Scrooge, with nary a decoration or a Christmas treat in my home. It’s a real “bah, humbug!” of a situation, I know, but alas, I only have 24 hours in a day, and my fantasy Christmas schedule calls for at least 72. Sigh. 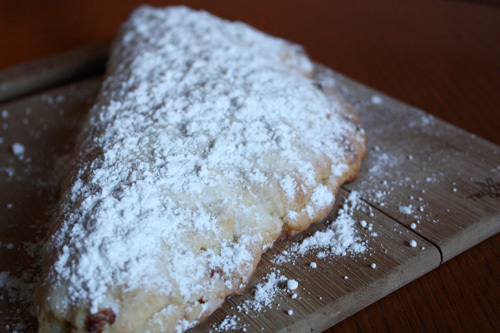 I do still make it a point, however, to bake a few holiday treats during the season. Because if it’s got sugar, I’ve got time for it. 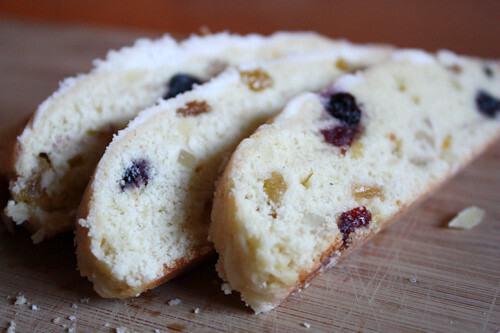 Last year, I made panettone, a traditional Italian holiday loaf. Rick Steves told me the other day that, during Christmas in Italy, children walk door-to-door in their neighborhoods handing out homemade panettone to the elderly who don’t have family in the area with whom to celebrate Christmas. Yes, I was watching Rick Steve’s “European Christmas” holiday special the other day. Yes, it did make me cry. Moving on. 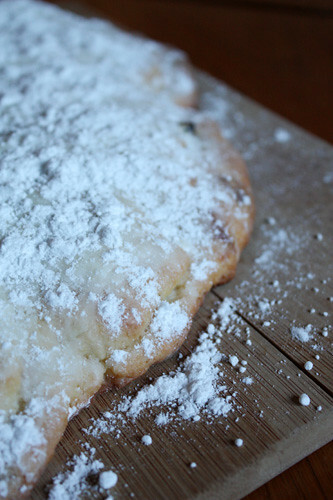 This year, I thought I’d keep with the tradition of holiday breads and baked this ah-maz-ing stollen. The husband was pretty happy about this one, as he grew up on the stuff. Soft, buttery and sweet (and I MEAN buttery and sweet — there are layers and layers of butter and sugar on top of the loaf), with colorful pieces of dried fruit inside that look like bright ornaments, it tastes like Christmas in bread form. For serious. This particular recipe is the easier, yeast-free version of the loaf, though it’s traditionally made with the ingredient. In other words, it’s the perfect recipe for us involuntary Scrooges who only have so much time these days to soak up the Christmas spirit. Not that I’m complaining — after all, no matter how crazy life gets, it still is the most wonderful time of the year. Debrief: Don’t freak out if the dough looks a funny shape — this is normal (as described below). Also, when brushing the bread with butter for a second time, don’t worry if it looks clumpy and, well, kind of gross — once you sprinkle it with sugar again and let it cool completely, you’ll be oh so glad you slathered on a double-dose of buttery, sugary goodness. Preheat oven to 325 degrees F. Line a baking sheet with parchment paper or set aside a baking stone. Turn the dough out onto a floured surface and knead a few times until dough holds together. Divide in half. Roll out each piece of dough into an 8 x 7-inch oval, about a 1/2 inch thick. Fold each piece of dough lengthwise (or crosswise, up to you) leaving the edge of the top half about a 1/2 inch short of the bottom half’s edge (see step-by-step here). 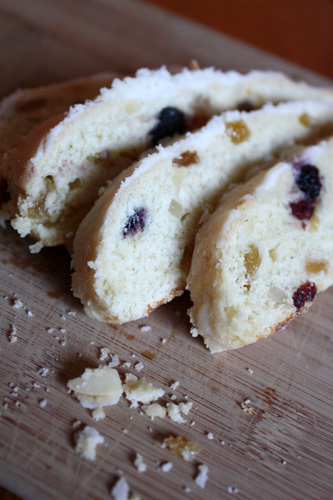 Extra punches: There are no rules when it comes to what kinds of dried fruits go into stollen. I tend to throw in whatever I have on hand which, in the past, has been anything from dried pineapple to dates. It’s all tasty. Also, if you want, you can toast the almonds before adding them to the dough. Also also, this bread doesn’t mess around — wrapped tightly in plastic wrap, it will stay fresh (and dare I say, get better) for up to an impressive 2 1/2 weeks. « Previous PostSifted Words — thankful. OOOOOOHHHHH……grandpa is going to be jealous!